Having a feeder shop to meet the demands of the ever expanding reptile trade is not a cakewalk nor is it for those who like a lot of sleep. 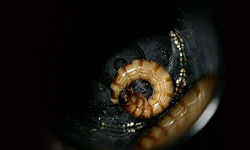 When we prepare to order our inventory, there is no one place to get: waxworms, hornworms, silkworms, calci-worms, phoenix worms, crickets in all sizes, or even live mice in all sizes as well as frozen ones. Just about every food item comes from a place that specializes in that food item alone. That means lots of freight pick-ups. In Alaska, where I live, it is even harder as some places won’t ship except to the lower 48 (like we aren’t really American). LOL. Our options are limited to USPS, UPS, FedEx, and air freight. If you want to make sure your feeders are all that they can be you will arrange for them to be held at the incoming facility, pray the shipper put your number on the box and pray even harder the workers will understand that they are alive and we want them to stay that way and that they should call us first after putting them somewhere safe. We have found that if you let them deliver instead of picking them up they go through more hands, an unheated truck ride and get to you maybe on a timely basis. I always opt for picking them up as they go through fewer hands and transfers and are consequently not stressed, hurt, cold, or even dead. Except for the frozen rodents, everything should be left in the box for a bit to warm up. I like to put the boxes in larger totes w/no tops so any hitchhikers and escapees can be easily found. After opening the boxes EVERYTHING in the box needs to be thrown out once the bugs are removed and safely transferred to their new home with fresh food and water gel. If you don’t throw out the filthy travel boxes you run the real risk of having your store infested with some bug you probably didn’t want. The ones you want you paid for so you don’t want them running loose either. 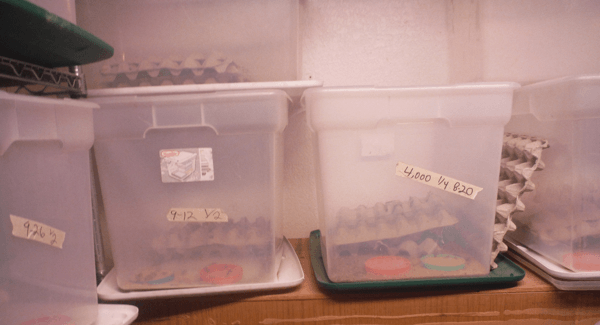 Do NOT reuse their food items or the egg crates since after being crammed with crickets they are full of sheds, feces, eggs from them and who knows what else. Crickets, one of our most common feeders, are kept in large (bought just for them), clear plastic totes. As they are put away, a piece of tape with the date and the size is put on the rim of the tote and we try to keep them in order from small to large as the totes go around the room. Once they are in and no debris is raining down to the floor of the tote it is time to put (I use red peanut butter jar lids) a lid of fresh food and fresh water gels. I like using filtered water but the filter needs to be plumbed in since if you use pitchers that is one more thing to keep clean and believe me you get ring around the rim like ring around the toilet. Since we capture crickets all day long we feel more debris falls into and on the water gel. We change it twice a day so they can have clean water at night once we are closed. To catch them we have an empty tote that we use to gently pick up an egg crate from the right size and put it into the empty “catch-them” tote. There are many ways to count crickets. One by one is by far the slowest. Having a tube with marks on the side where you have precounted how many fit to that mark is the best. Then they are put into a plastic bag with some clean paper towel or clean egg crate; the bag has its sides put together catching air and twisted tight and then rubberbanded. If you are not the cashier you write in marker the number of crickets in the bag. After you have caught what you need you must remember to gently put the crickets back into their tote as the catching tote has no food or water gel. If you keep them CLEAN and well FED and WATERED you are able to rotate them to the next size up can as you get ready to clean the cans for the next shipment. If there was a good run on crickets and all sizes needed reordering because only a few of each size are left some feed shops will put all the left-over ones into a sale bin. Then the cricket bins are cleaned and readied for the new ones. Never mix old shipments with new ones. I have run pet stores and the rule is always new fish go into new tanks, new birds go into clean empty cages, etc…you don’t want to chance cross-contaminating your healthy ones with the new ones that haven’t been evaluated, fed, and watered yet. If they come in sick you will have sickened all of the ones you so carefully cared for. I like to use a good commercially prepared cricket chow that has been formulated just for crickets though I will admit I add powdered milk for calcium to their diet. I will close with the admonishment to use your eyes (checking for cleanliness) , ears (for loose ones as that is a sign of a sloppy store), and mouth to just say no to badly maintained shops. If the floors and counters are not clean it’s a sign you need to run and run fast. Your nose will tell you a lot about store also. There is no excuse for trails of rodent feces or the smell of it or of death. If an animal doesn’t look healthy, i.e. clean clear eyes, nose, vent, ears, no ticks, good muscle tone and the salesperson is knowledgeable and friendly, willing to answer questions you have found a good place. Don’t settle for substandard; your beloved pet deserves better. I hope you like the pictures of crickets in their bins safe and sound getting gut-loaded for your loved one. For my next article, I will write about how a shop gets its hornworms and how they should be cared for and what to look for before you buy. Sharon D. Webb started in the pet industry at age 18 (she is now 60+) when she was hired to close the first pet store in Alaska. She turned sales around and bought the shop and turned it into the largest Pet Store in Alaska. the Anchorage Pet Palace. She has owned 3 different Pet stores, each with a grooming parlor and an isolation room for those needing TLC. She was the first person in the state to have Burmese pythons mate and lay eggs. She breeds most of her own live feeders and is in the process of opening Alaska's first reptile spa; which will include large, long tanks with water current for people to rent for their snakes, iquanas, and other water lovers to swim and get exercise. For 4 years she had a talk radio show called: Pet Talk; which was very popular. She has been a fixture in the pet industry in Alaska for over 40 years. She is proud to have been bitten and pooped on by some of the coolest critters in the world. She believes that: Pets are People Too!!! She hopes that the breeders of today will start keeping pedigrees and birthdates on the babies they sell. 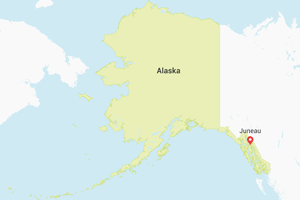 In a recent blog on November 5, 2013 a writer by the name of Sharon Webb submitted an article on feeder shops in Alaska. This article contained a picture that did not belong to her. Sharon Webb was a volunteer for Dianna Smith at The Alaska Cricket Ranch and took a picture of the Cricket Room at Dianna’s business. Sharon Webb’s business The Anchorage Pet Palace was shut down many years ago and she has not been in the Pet Industry since age eighteen as stated by your writer. The Alaska Cricket Ranch would be happy to work with Gecko Times but please publish a comment that the picture was compliments of The Alaska Cricket Ranch. Please, contact Dianna Smith at (907)240-7111 or by email to clear up issues of copy write materials. 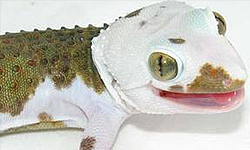 The information supplied to Gecko Times was information, policies and procedures that are in place at the Alaska Cricket Ranch. 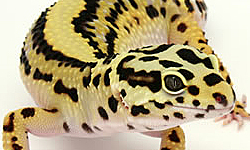 Sharon Webb volunteered, learned how I run my feeder shop and sent all my practices into Gecko Times to be published. Please, investigate for your self to find the truth. Please go to dianna@alaskacricketranch.com to see the real story about feeder shops in Alaska. You will have an option to watch a news story about the Alaska Cricket Ranch and Dianna Smith. It is the only feeder shop in Alaska. 1. Regardless of the content of the photo, it was taken by Sharon Webb and does belong to her. However, Gecko Time hereby states that the photo of the totes in the article above was taken at the Alaska Cricket Ranch. There is no copyright issue since the photos were taken by Sharon Webb. 2. Sharon describes policies and procedures she uses to care for crickets. At no time does she state that she has invented these procedures. Gecko Time does not feel there is any need to make any changes to the article as published.